Hi! Today I am participating in Kylie Bertucci’s International Blog Highlight! The theme this month is “From Me to You when you are Feeling Blu”. You can vote for my card by first clicking on this link: Kylie’s Blog Highilght then click on the heart in the upper right hand corner of my card. I’d love your vote if you feel it is worthy! 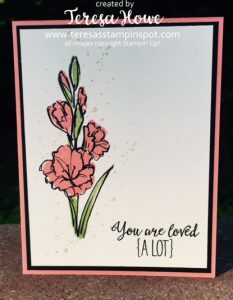 The flowers are from the new hostess set Gift of Love – they are so pretty and easy to stamp! The sentiment is from the Grateful Bunches set. I also added a little interest by stamping the splatter from Gorgeous Grunge over the flower. I made this for a friend who is going through a difficult time to let her know she is loved. Don’t forget! Bonus Days are here! 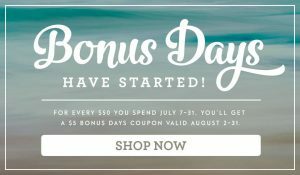 For every $50 purchase (US – prior to S/H and tax) you get a $5 bonus coupon to use in August!! Shop my on-line store today by clicking on any of the products below. Beautiful card Teresa. I love less is more cards!